Why do they use the term "penny" in nail sizes? An outbreak of tornadoes began touching down on April 25th and continued until April 28th when the storm dissipated. During the 4 days of destruction there were 127 confirmed tornadoes. During this same period peole reported a total of 426 tornadoes in the area. A reported 259 tornadoes in 16 states occurred on April 27th. One of the tornadoes has been confirmed to be a F5 with wind speeds in excess of 205 mph. These tornadoes caused the greatest loss of life since two tornado outbreaks occurred in 1925 and 1936. At the time of this report there are at least 337 confirmed deaths from this outbreak. Thousands, if not millions, of king crabs are making their way upward on the seabed floor of Antarctica. The migration began in 2007 when king crabs that have been living at depths of 6,000 to 9,000 feet began walking upward on the continental floor in the Southern Ocean. Their main prey are soft shelled clams, snails and brittle stars that live in coastal Antartica. Scientists fear these animals may be wiped out because they have no defense against the crushing power of the king crab's claws. Two volcanoes located on the Kamchatka Peninsulain a remote part of Russian began erupting this past month. One of the volcanoes spewed ash more than five miles into the air. Shiveluch volcano which sent ash high into the air is located beneath a major trans-Pacific Aviation flight path. Ash from Kisimen volcano on the peninsula covered moss vital to reindeer. The reindeer are leaving their normal feeding grounds because of the ash mixed with snow in the area. A sloth travels so slowly that it would take a sloth one month to travel a mile. Twelve rocks are known to have landed on Earth from Mars. It is an urban legend that there are no lakes in Ohio. They have oxbow lakes and Kettle-hole lakes. Kettle-hole lakes formed when the glaciers receded forming small pot holes. Dollar bills last a long time because they can be folded about 4000 times before they tear apart. Off the coast of Australia there is a heart-shaped coral reef. Some dolphins can look in a mirror and recognize themselves. Astronauts traveling in space can see the golds and browns of autumn leaves. 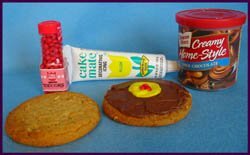 In this activity you will decorate a cookie showing the crust, mantle and cores of the Earth. Spread the brown frosting on the surface of the cookie so it almost reaches the outer edge. Spread the yellow frosting over the brown frosting in the center of the cookie to represent the outer core. Place three red cinnamon candies in the very center of the cookie to represent the inner core. Scientists discovered there are layers inside the Earth using data from earthquakes recorded on seismographs. The outer surface we stand on is the crust. Beneath the crust is the mantle. The core is located at the center of the Earth. The outer core is liquid and the inner core is solid. The term originated in England as a measurement for the length of a nail. No one is sure but the term is thought to have originated in the cost of the nails. The cost of a certain size being 10 pence or 10d, which is the British symbol for a penny.